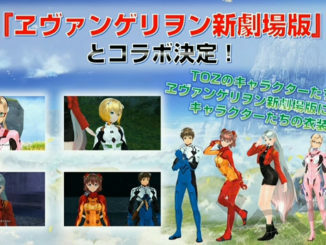 A lot of characters love to fly in this anime. We now have a Shepherd! Guess who? Disclaimer: This review comes from someone who has played the game and will heavily compare it with that. 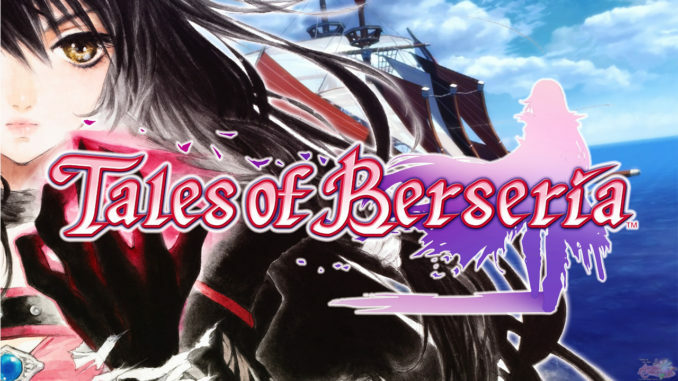 If you have not played the game, this review will contain obvious game spoilers. This is also based on the DAISUKI.net release. Beautiful scenery right off the bat! 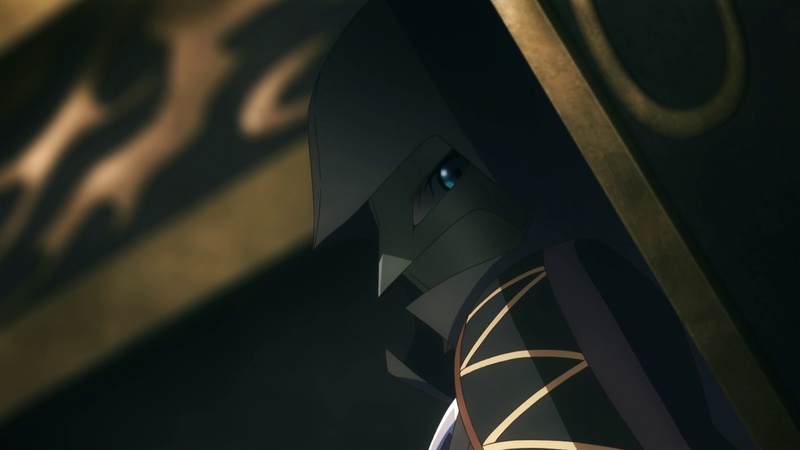 © ufotable 2016. 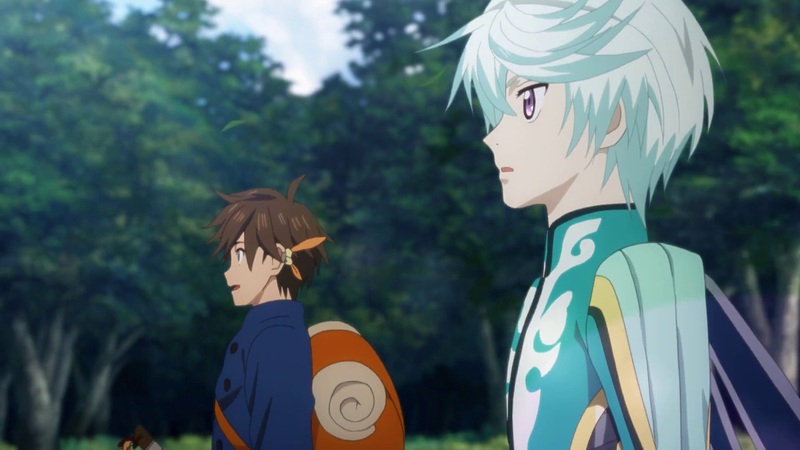 The episode wastes no time and decides to throw Sorey and Mikleo right into Ladylake, the capital of Hyland and the place said to be the Lady of the Lake's residence. 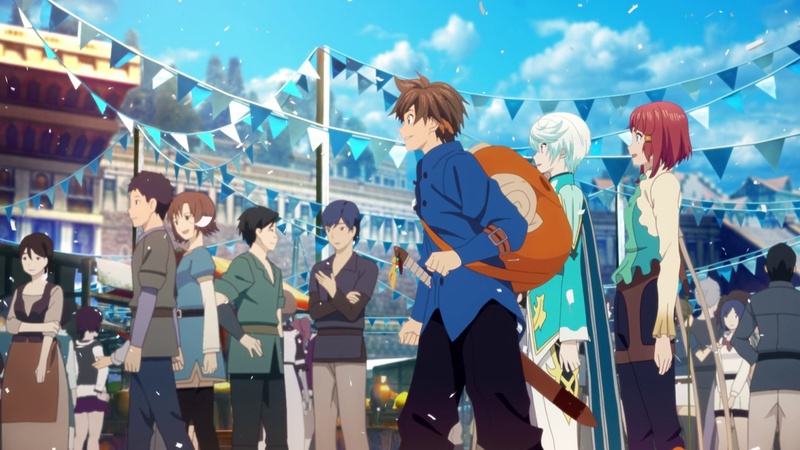 The two are impressed with the number of people by Ladylake's gates and Sorey's trying to look over what's being done there. Someone behind them calls out that it's a border inspection. See? See?! This is what I meant last episode! 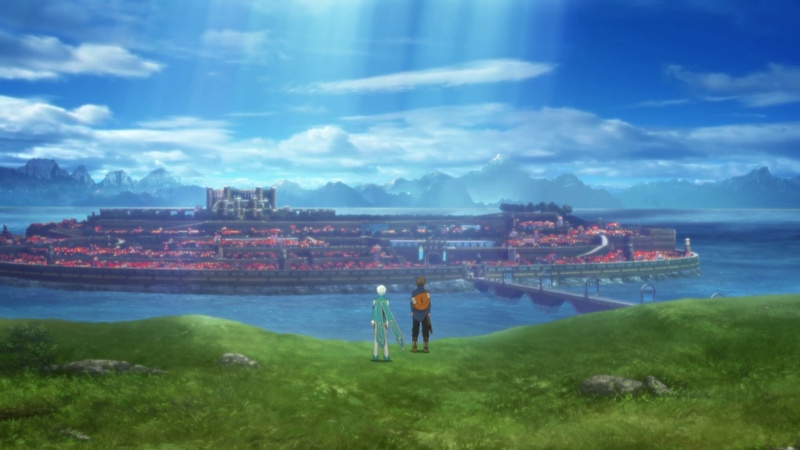 They should have built up the scene of Sorey and Mikleo first seeing the world for themselves like how seeing Ladylake for the first time is for them in this episode! I mean, I'm pretty sure the view of the world from the last episode was much more impressive than Ladylake alone. 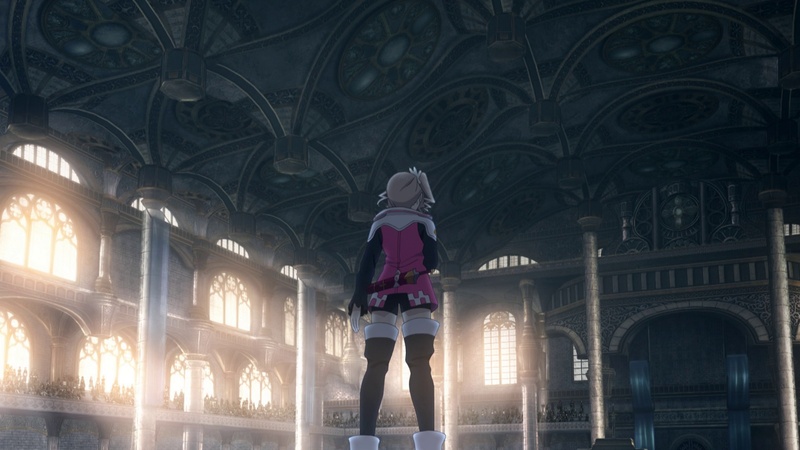 Anyway, the girl (Rose in her merchant attire) comments that they must be here for the Sacred Blade Festival, and that they should hurry since sign-ups are about to close. 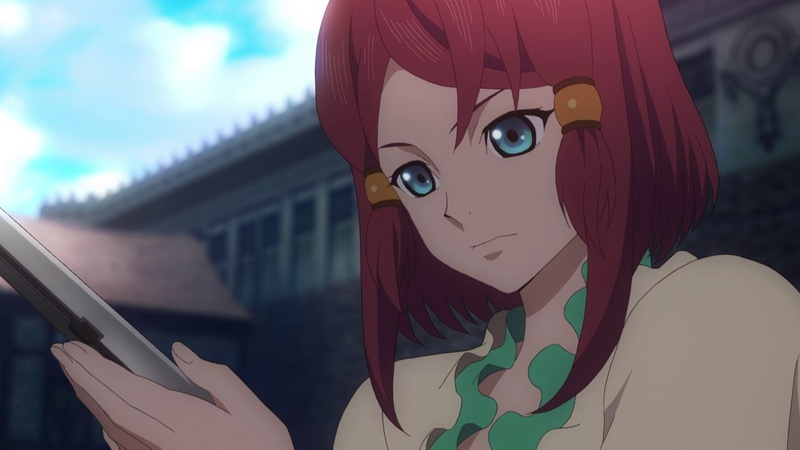 She asks if they have a pass, but obviously, Sorey having been shut in Elysia all his life, doesn't know what that is. Though they can get in without one, it'll take time, so the girl offers to help him out. As they go in, the girl introduces her group as a group of merchants called the Sparrowfeathers. Being merchants, they are protected by a free trade treaty and have free passage to all towns. You have no Gald because you didn’t get Grandpa’s pipe to sell. Tsk tsk. However, the girl's services aren't free. 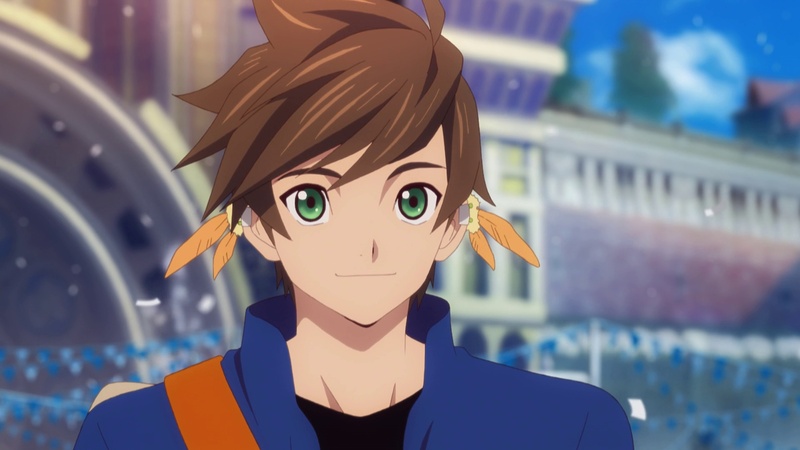 (Welcome to human society, Sorey!) She's asking for 500 gald in return for helping them get in quickly. 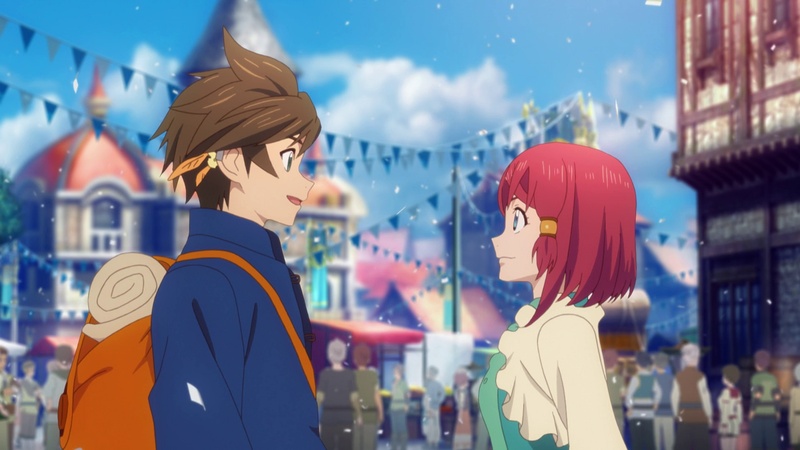 Sorey replies that he doesn't have money, but the girl doesn't believe him and starts rummaging through his bag. Sorey: Please don’t rummage through my prickleboar bag, I smuggled in some prickleboar jerky! She finds something of interest and takes it out - it's Alisha's knife. She obviously recognizes the emblem of the Hyland family on it. 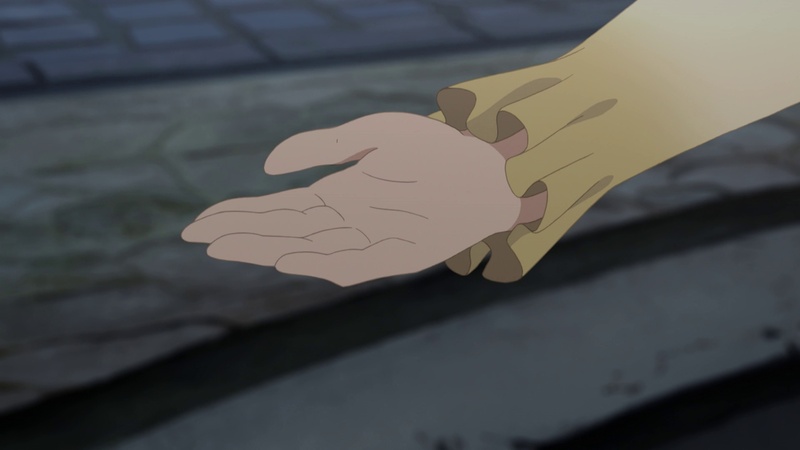 Sorey pleads not to take that since he still has to return it (to Alisha). The girl lets it slide for now. 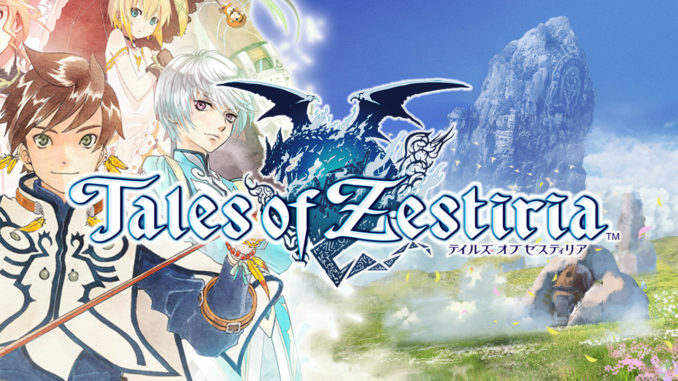 I'm just going to add this in for the benefit of those actively comparing this to the game like I am: In the game, something similar occurs to Sorey and Mikleo, though not like this. 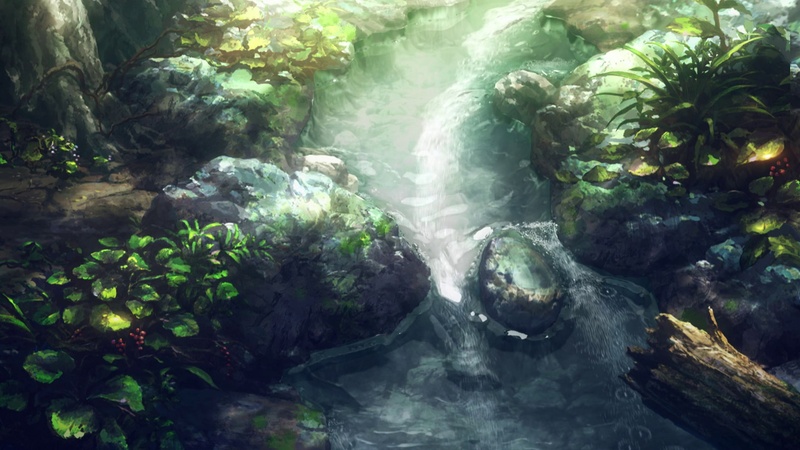 At the entrance of Ladylake, there is initially a broken cart there belonging to the Sparrowfeathers. Sorey can talk to them, Rose included. She'll notice the knife and will want to buy it from Sorey for 1,000 Gald. Sorey has the option to refuse, but even if he sells it he can get it back later via a sidequest. 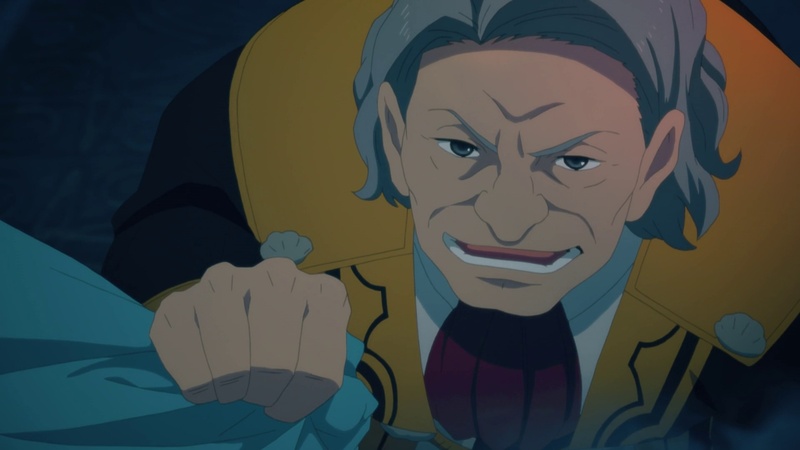 Once their cart is fixed, Sorey can enter Ladylake no problem, with a guard even welcoming him. 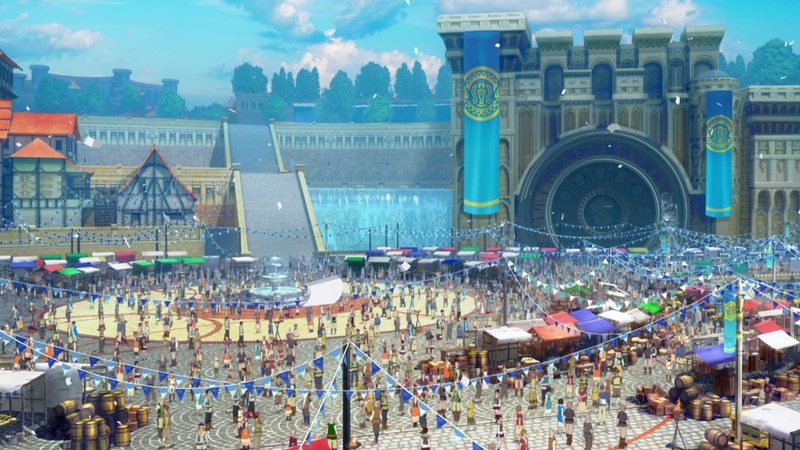 Then later in the game, Sorey will have trouble going into the sanctuary where the actual festival proper is being held since there are so many people by the entrance. You can get to the rear entrance by showing the knife to a guard, but if you sold it (and you won't have it back yet by this point), Rose will also help you out for a fee - in this case you can sell to her Gramps's pipe. In the game, by the way, Gramps gave his pipe (via Mikleo) since, as Mikleo said in the anime, they need money in the human world, so he told them to just sell his old pipe. Unfortunately it doesn't seem to be shown in the anime, but it was in Dawn of the Shepherd. 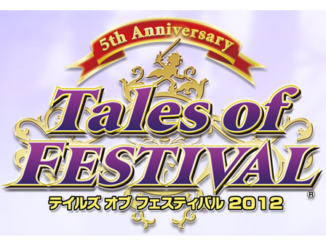 Woah, why wasn’t the festival this lively in the game? Someone tie him down. He looks like the stereotypical anime character that’s going to wander off and get lost once you look the other way. 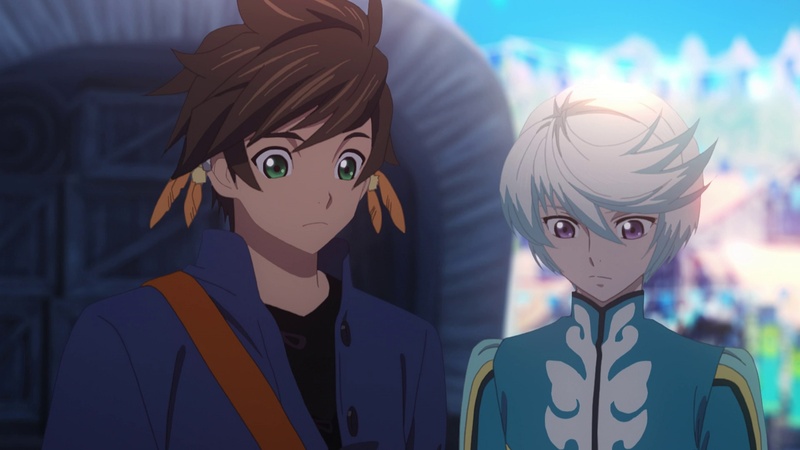 Sorey and Mikleo marvel at the festivities and the amount of people. 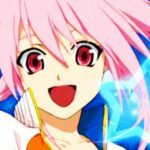 The girl notes that since it's the Sacred Blade Fest, there are way more people than usual. Yes, yes, definitely here on official merchant business. Definitely not here to assassinate anyone, nope. 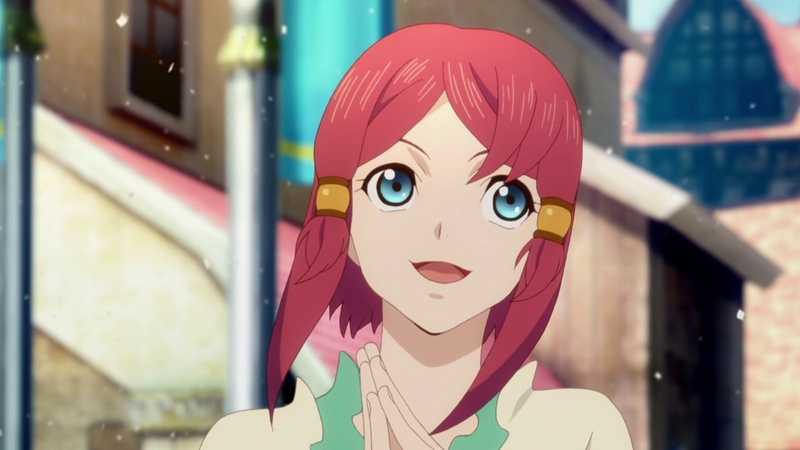 She notices her Sparrowfeathers fellow merchants waiting for her, and she bids farewell to Sorey, remembering that she's here on business. Sorey thanks her for helping him out and the girl leaves and says to enjoy the festivities. Note that they never actually introduced each other to themselves. In the game they do, though, by the Ladylake entrance. 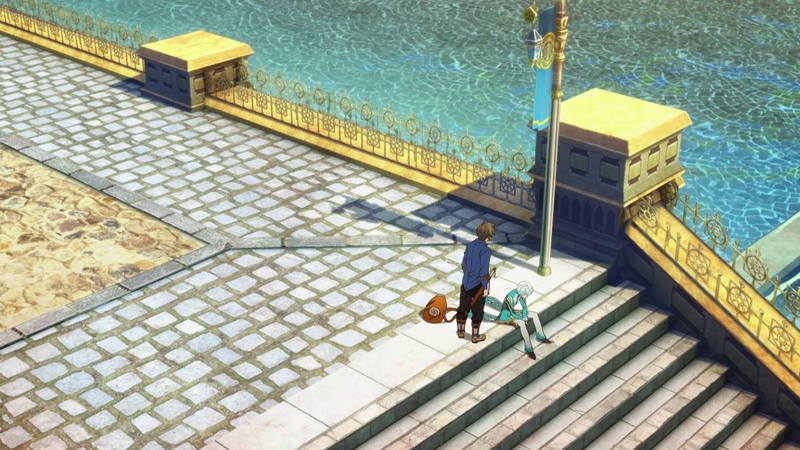 Once the girl leaves, Mikleo says they should start looking for Alisha, but is cut off by his feet getting unsteady. Ladylake, it seems, is teeming with malevolence. The two move away from the crowd a bit and settle above a flight of stairs. 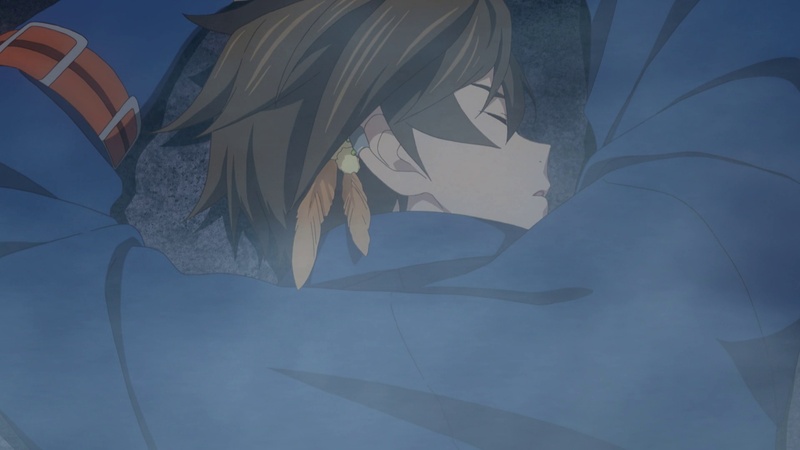 Mikleo rests a bit. 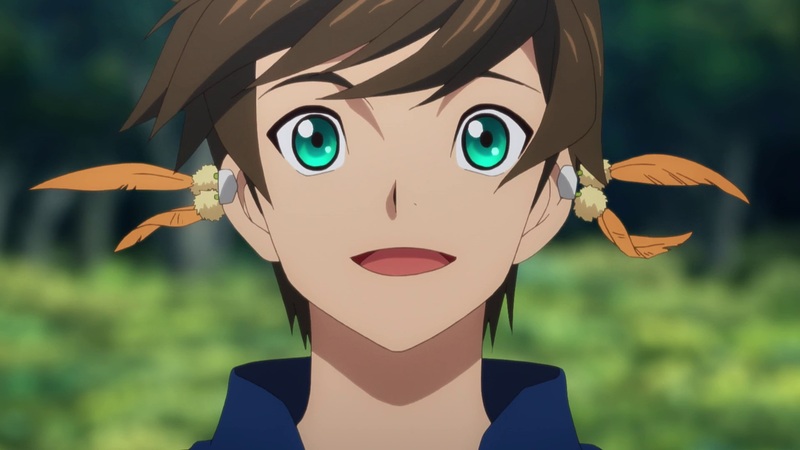 From their vantage point (and considering how sharp Sorey has been in the anime so far), Sorey suddenly spots Lunarre. The two start going after him. I must go, my humans need me. 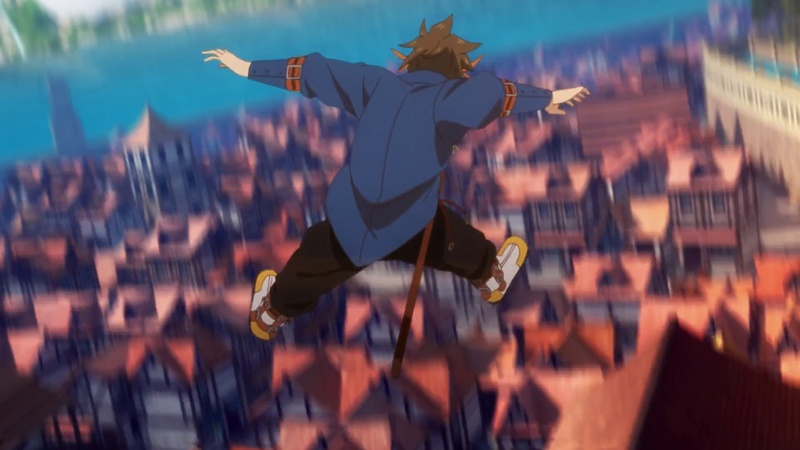 ufotable really loves to make things more dramatic and complicated by making everyone just... jump around and fly like it's the easiest thing in the world. It takes everything up a notch, sure, but it's not something necessary to make it that impressive. 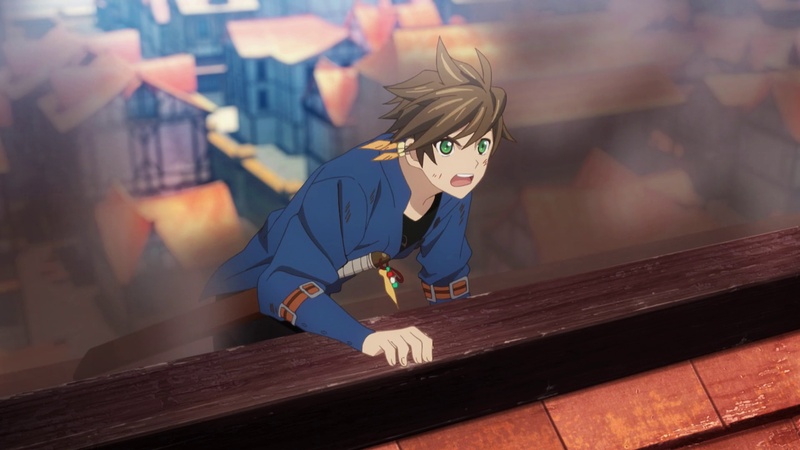 Through all their jumping and parkour-ing, Sorey manages to catch up to Lunarre and they yell it out at the rooftops. 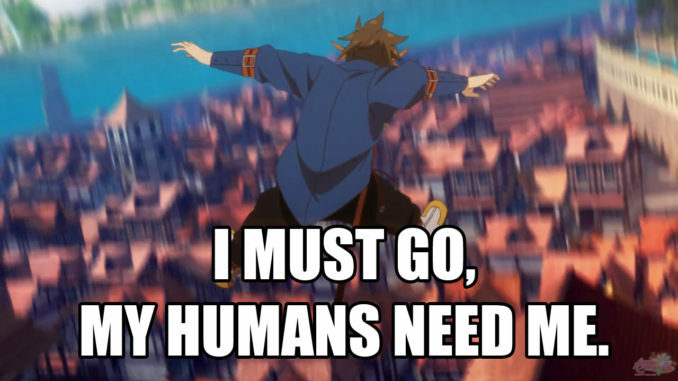 Sorey demands to know why he's after Alisha. In the game, I always thought that Lunarre was after Alisha because it was requested from the Scattered Bones, but he answers differently here. He says that he no longer sees Alisha as his enemy and is just stalking tagging along because she interests him - wherever she is, interesting things seem to happen. 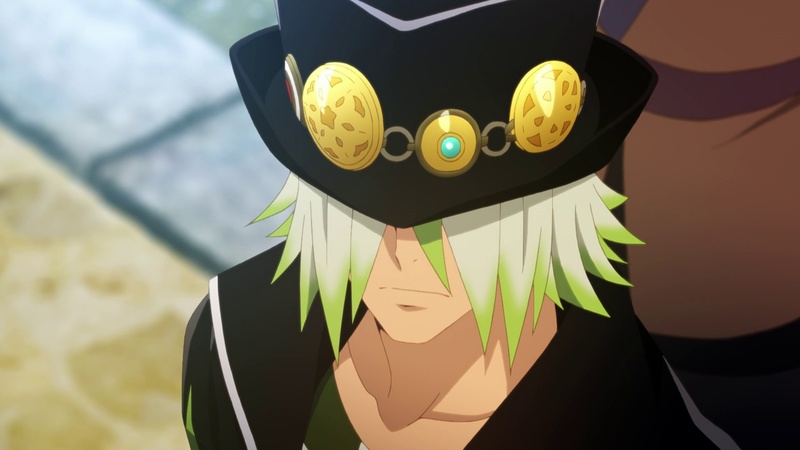 He warns the two that even though he's not a threat to Alisha, others may still target her - vaguely, he mentions that the "request" to have her assassinated hasn't been revoked, and that "that person" (most probably Rose) always gets a task done. He then flies way again. 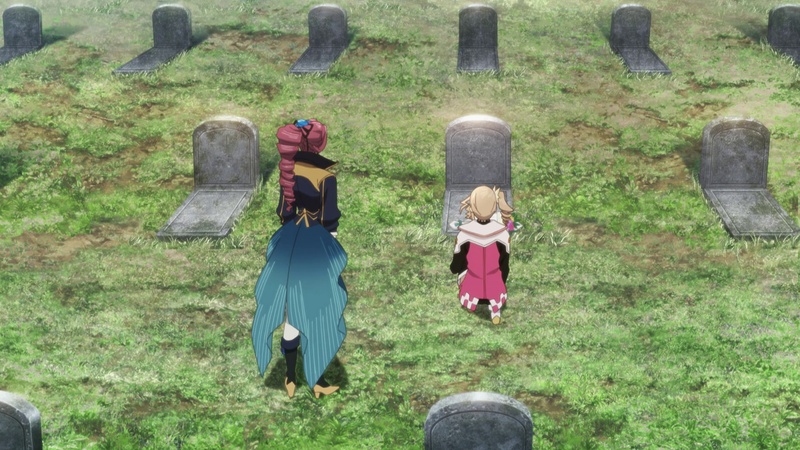 We're again shown Alisha, who is paying her respects to what seems to be a grave placed in honor of her recently deceased knight friends. Knowing what happened in #00, they probably couldn't even retrieve their bodies...except maybe Tao, I'm not sure. Alisha inquires from Maltran about the state of Guriel since then, and she replies that they found no survivors. Maltran comments that she finds Alisha's recount of the events hard to believe, but Alisha says that it's all true. Maltran: You still haven’t told me the part about how you got away from the dragon. Alisha: That’s a secret, shh. 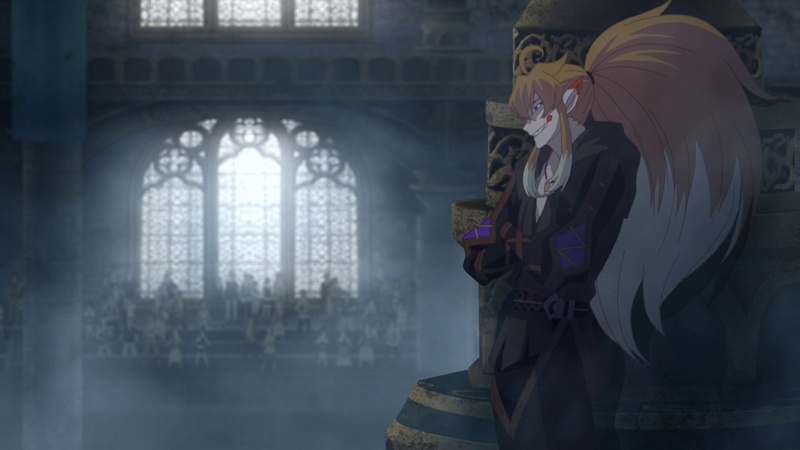 Alisha also said the same story, unfortunately, to Bartlow, mainly because it really is the truth and not just some snide remark at the chancellors wanting to recruit young blood during the Sacred Blade Fest. 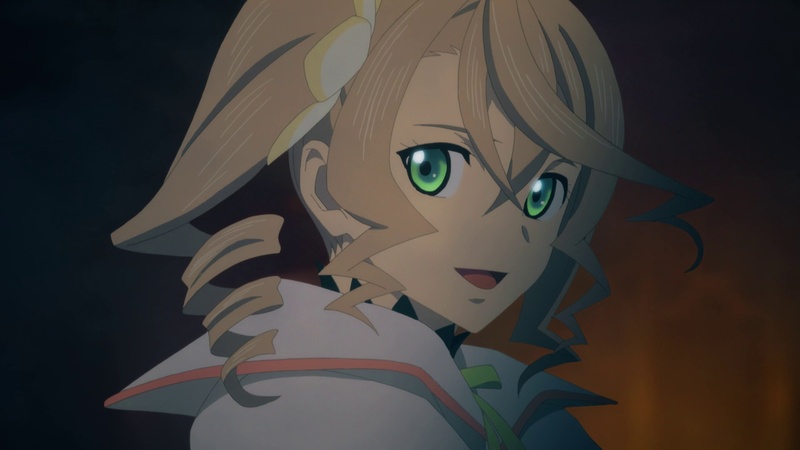 Alisha insists that they should just maintain peace and not start a war, since it will only start a chain of hatred. The same should be done even if the other side attacks. Good point, but with a whole city full of people with differing opinions and fear of the enemy, that's going to be hard to come across. Maltran comments that with the military at their core, no official would accept such reasoning. Maltran leaves, advising her to think well about it before acting. At what seems to be Bartlow's office, he's talking to a couple of the assassins. 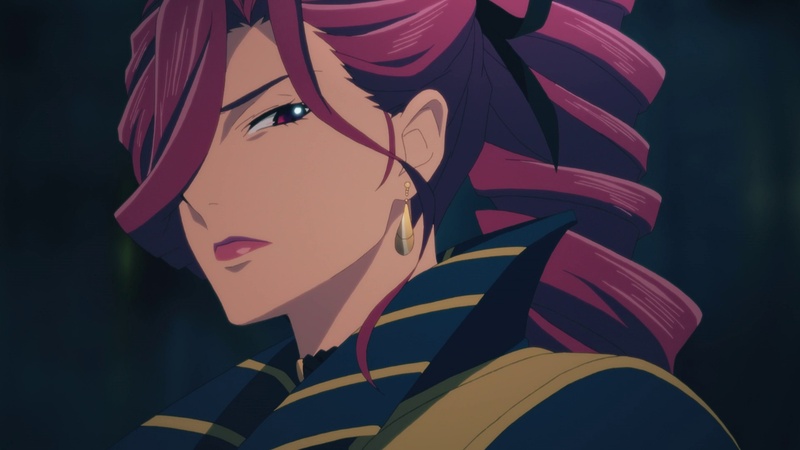 He's recounting to them Alisha's decisions - about not wanting to attack even if the enemy empire seems to be marching toward Hyland (are they even? ), that they will attack only when they actually are attacked. Bartlow says he tried to convince Alisha otherwise, but she wouldn't budge. 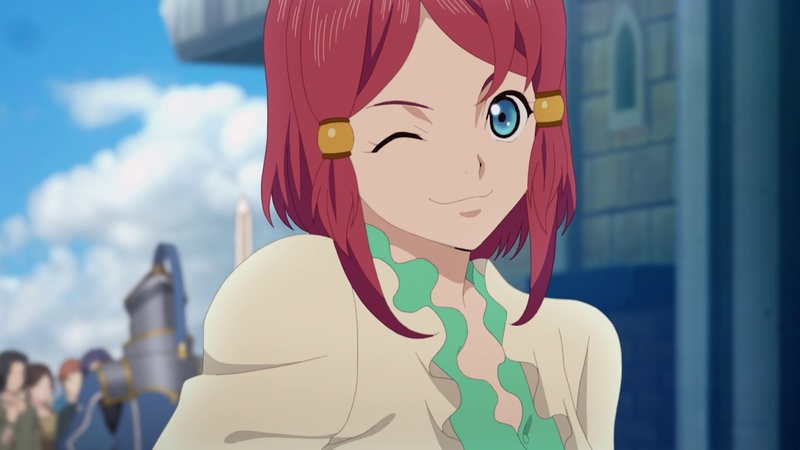 There are also rumors that Alisha is sided with the Rolance empire because of her decision not to fight. 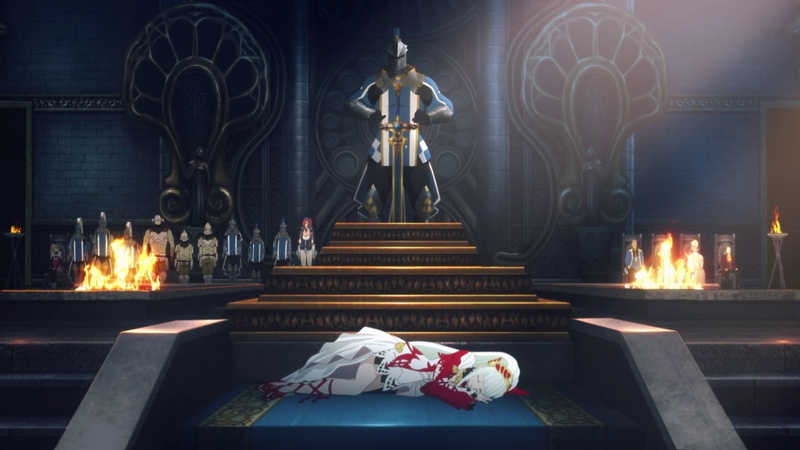 One of the assassins, who's the same leader from #00 (and is, of course, Rose), says that they are there to make sure Alisha is assassinated, but the criteria for that is Alisha's death will prevent civilian deaths. 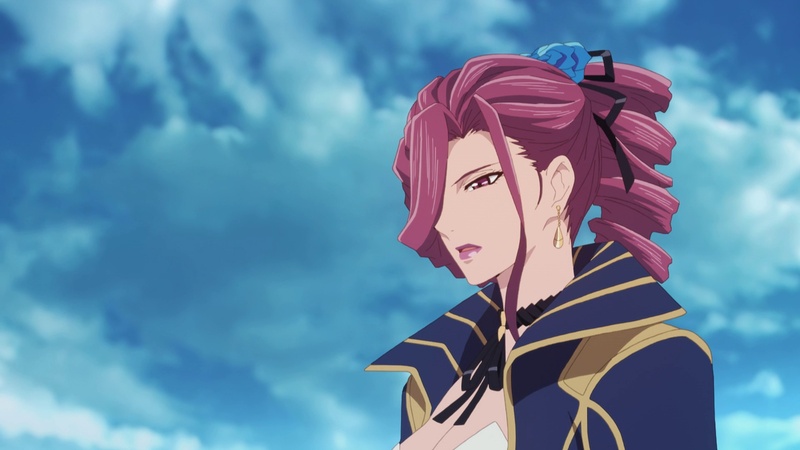 Bartlow, obviously, insists that Alisha is just bringing their kingdom to disaster and that many may die just because of her ideals of non-aggression. The leader comments how it's naive of her and ultimately re-accepts the renewed request to have Alisha killed. 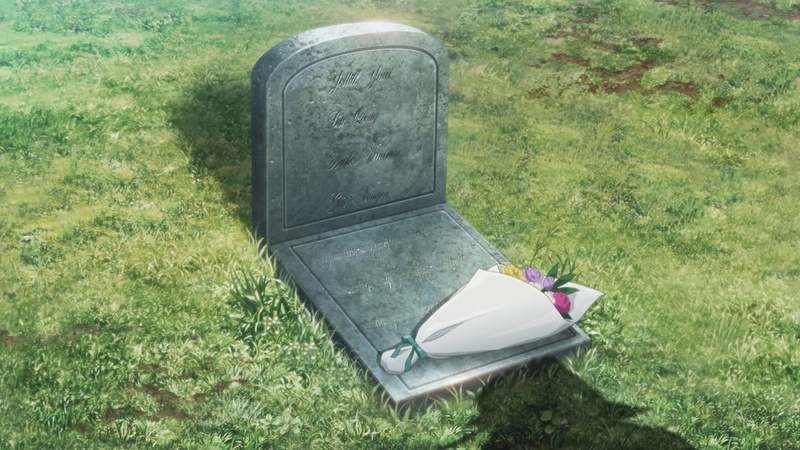 They probably put it on hold when she went missing during the time in Guriel. Outside, and probably during a different time, Lunarre is hanging out over some rooftop. He looks down at the queue of people coming into the sanctuary, and he sees Rose and one of the merchants (Eguille). 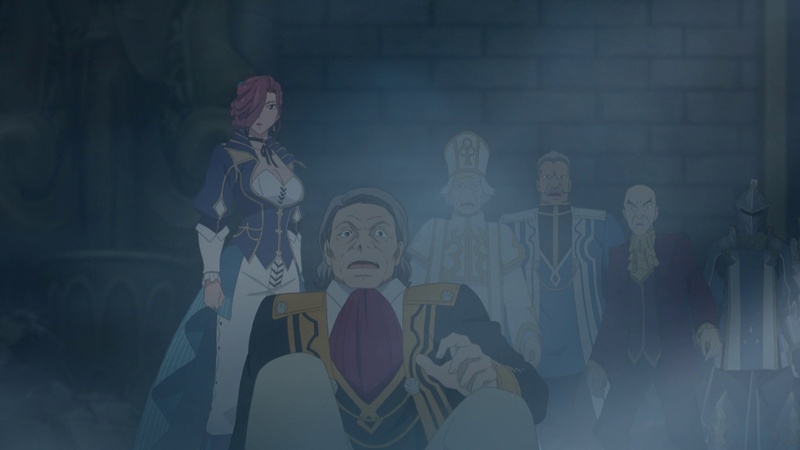 Behind them, someone who wasn't shown earlier, is a man who looks up at Lunarre - it's Dezel. 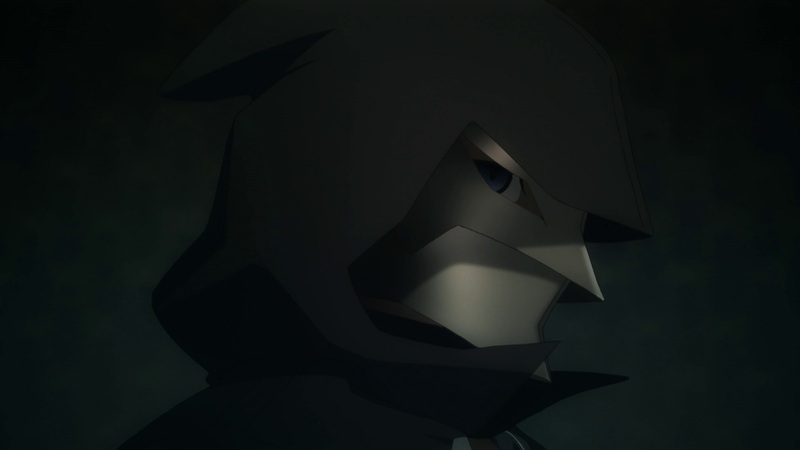 Lunarre stands up, seeing that he has been noticed by him. 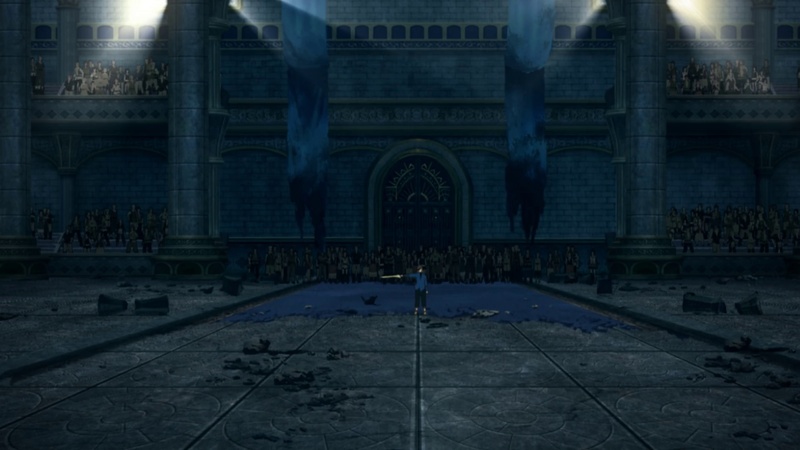 Inside the sanctuary, the main event of the Sacred Blade Fest begins - the rite of the warrior aka the attempting to pull the Sacred Blade out. This apparently happens on the final day of the five-day festival. From their seats, Sorey and Mikleo notice a young lady sleeping before the sword. The two immediately recognize her as a Seraph - and possibly the Lady of the Lake from the legends. As one random soldier is trying to pull out the sword, the Seraph wakes up. From around her, a brown mist fills the room - for her, it seems the world is possibly beyond saving with this amount of malevolence. The Sacred Blade Fest continues. We have the leader of the Scattered Bones and even Lunarre watching. Sorey and Mikleo talk about how being able to pull the sword means the Lady of the Lake sees you worthy to become the Shepherd. The last person tries to pull the sword but obviously fails. Alisha stands and gives a speech before the people. She talks about the legend of the Shepherd and how despite not having one appear during their festival, she believes that they should live in peace with others like how the humans and Seraphim did in the days of yore. (Uh oh). 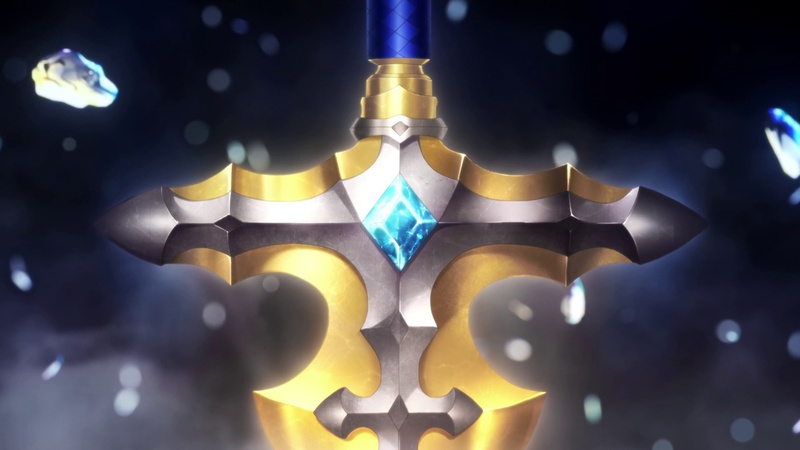 With Hyland and Rolance's relations becoming increasingly tense, some saw the Sacred Blade Fest as a celebration of war, but Alisha expresses her belief that they will not attack Rolance unless Rolance attacks first. 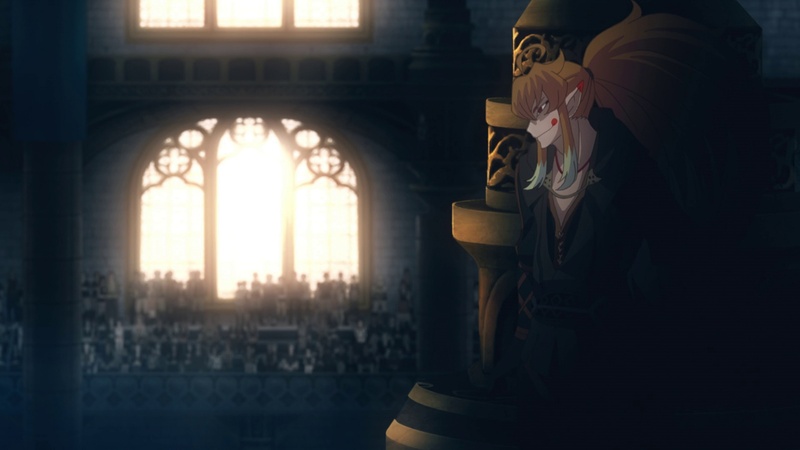 Maltran notices the dissatisfaction among the audience and tries to stop Alisha's speech, but it's too late. 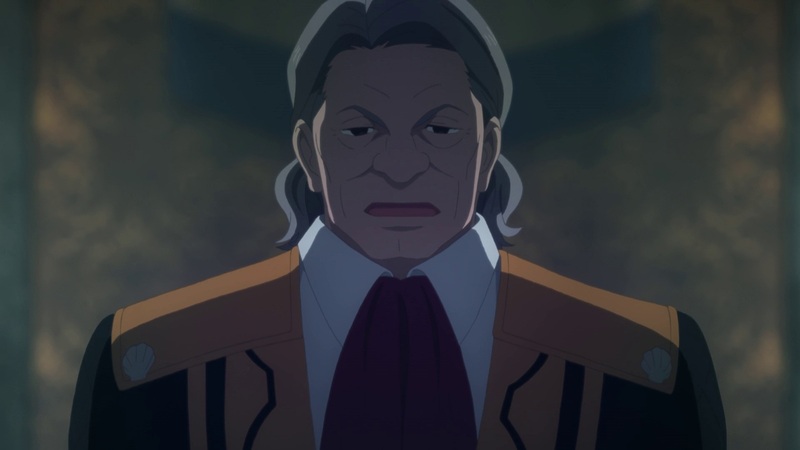 The level of malevolence overtakes the entire sanctuary. The torches lit around the room explode and the windows are covered by darkness. The further increase in the people's fear only strengthens the concentrating level of malevolence, making it give birth to a hellion - a dragon form, at that. From the size of it, it looks like a Dragon Puppy if we're talking game terms. If you've played the game, that actually doesn't make sense since dragon form hellions only come from corrupted Seraphim. 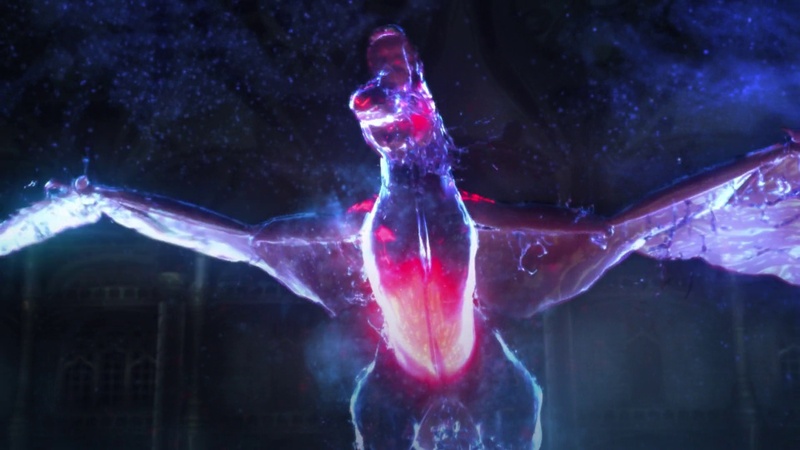 Technically, the high level of malevolence will turn a Seraphim into a dragon form. Lower dragon forms, such as a Dragon Puppy or a Dragonewt, can still be reverted back to their Seraphim forms and are usually not seen by humans properly, which is why I think this is a Dragon Puppy. 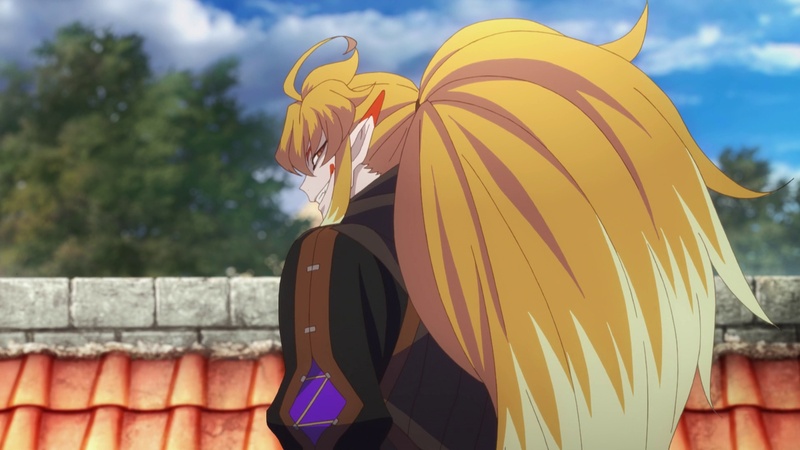 Full-fledged dragons, which I believe was what was in Episode #00, can actually be seen by humans and can no longer be reverted back to their Seraphim form. This would explain why Alisha and her astronomer seemingly saw the dragon form during #00. So technically, that's a Dragon Puppy since the humans can't see it properly. 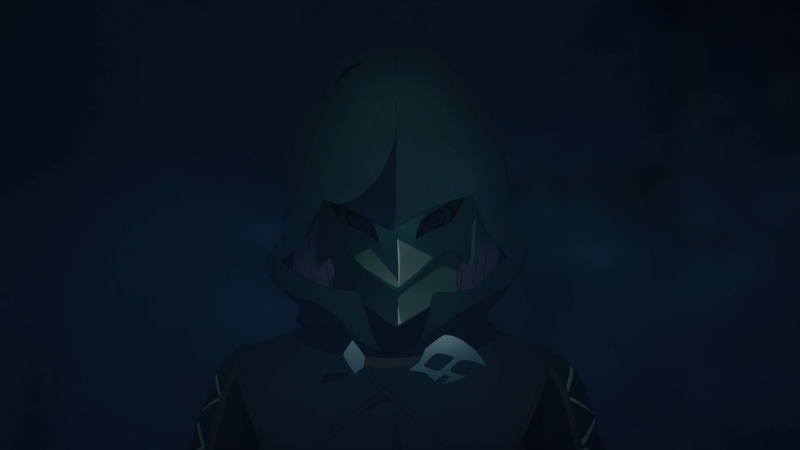 There is no Seraphim around that got turned into one, though, so I guess the anime will be straying from that particular detail in the game and just make it as if hellions = dragons. Anyway, the dragon (puppy) goes around on a rampage, destroying the sanctuary. It tries to attack Lailah but she easily deflects its attack. 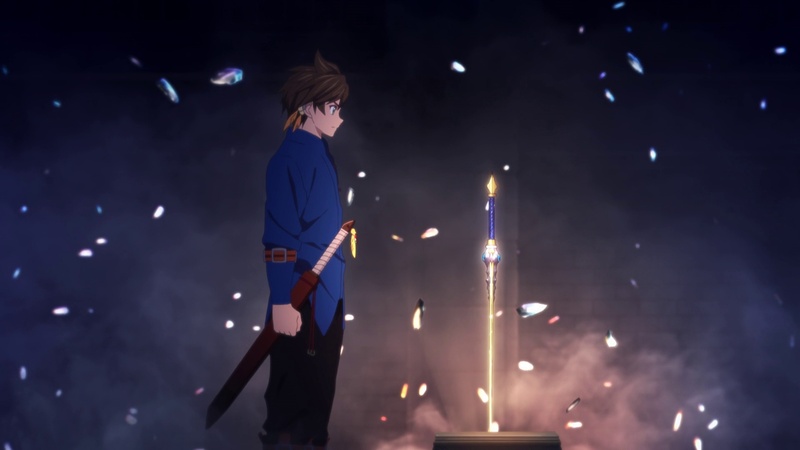 Sorey notices and decides to go down toward the altar with the sword. Sorey meets up with Alisha by the altar, much to Alisha's surprise. Unfortunately, she also notices that the entire sanctuary is almost in flames - they have a huge number of people trapped to their doom. 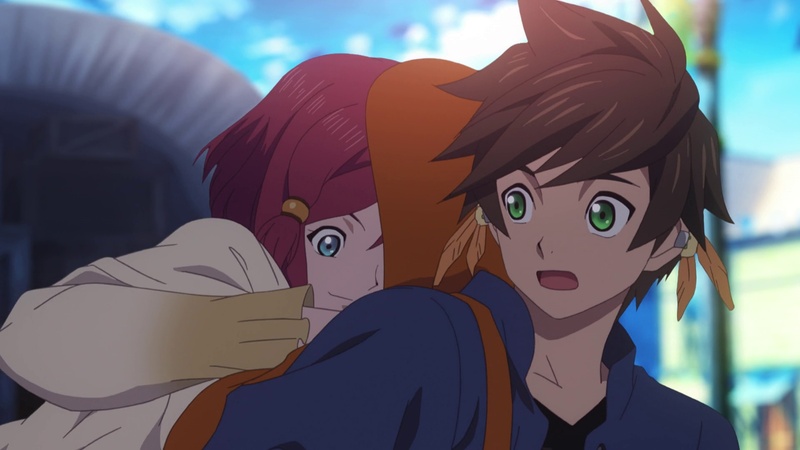 Alisha doesn't know what's happening and Sorey says it's because they can't see it. 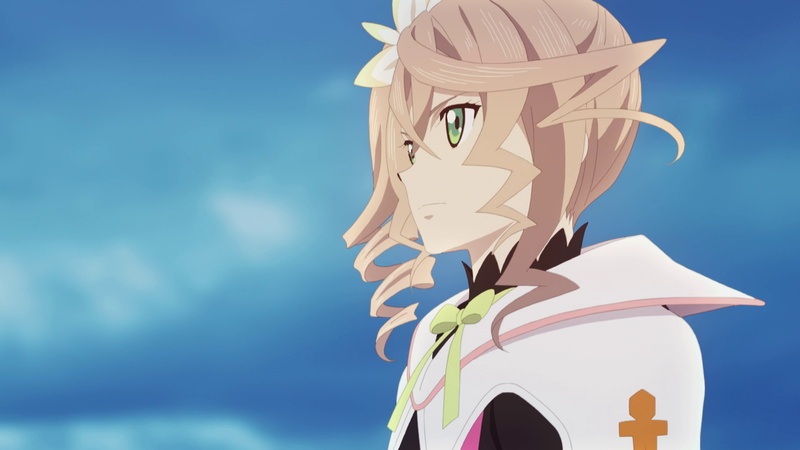 Sorey leaves Alisha to go toward the Lady of the Lake. 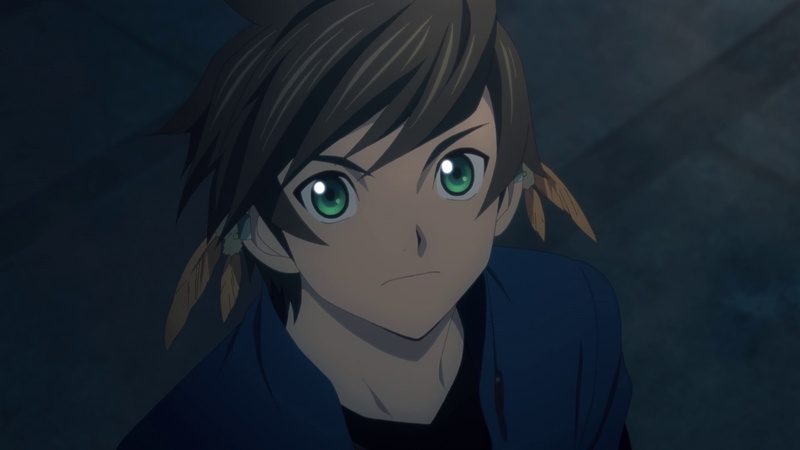 Sorey introduces himself to the Lady of the Lake and asks her if she can do something about the hellion. Unfortunately, she answers that only a Shepherd will be able to purify it. 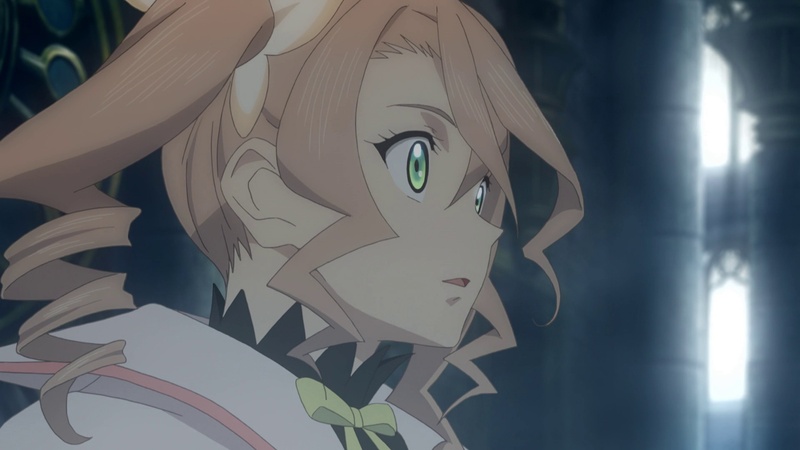 As the two talk, Alisha watches, finally realizing that Sorey really can see the Seraphim. Unfortunately, the leader of the assassins (Rose) takes this opportunity and attacks her. 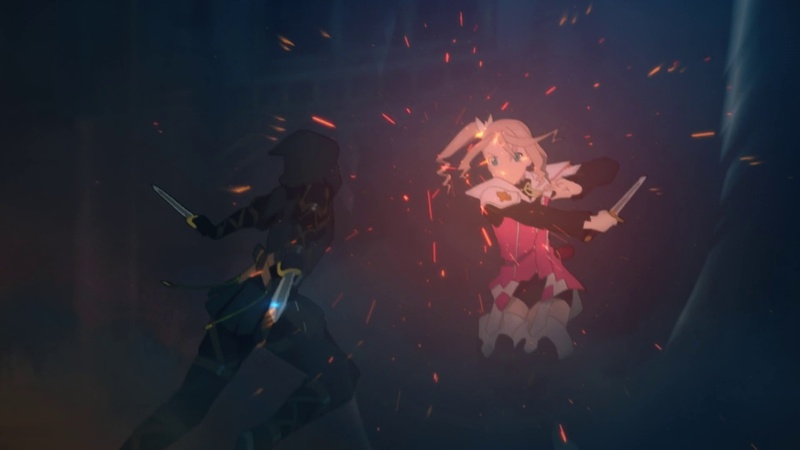 And as we've seen in #00, Alisha can hold her own in a fight. 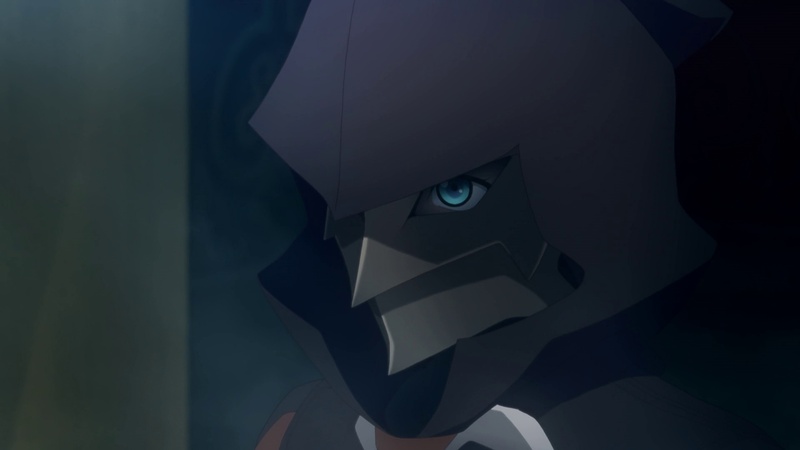 The assassin states that as long as Alisha's around, the people will suffer. Maltran: Unhand me, Bartlow, I just had those laundered. 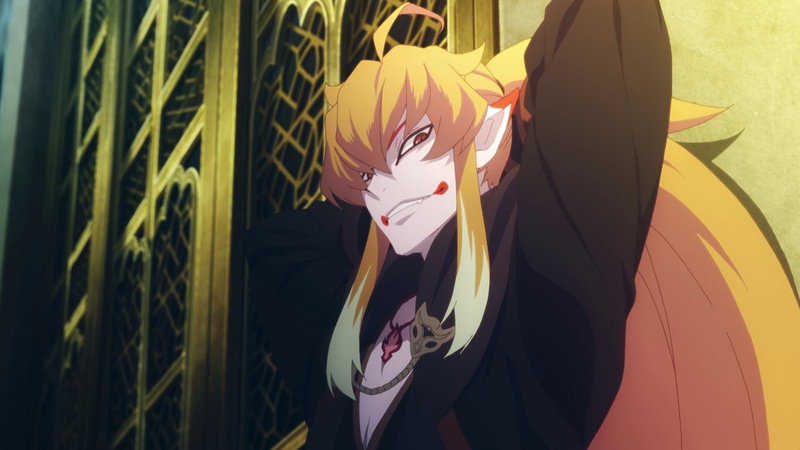 Maltran tries to help with the fight, but Bartlow stops her, saying that Alisha can take care of herself and that evacuating the people take priority. Despite looking displeased at this decision, Maltran doesn't interfere with the fight (gee I wonder why). Alisha and Rose continue to fight. 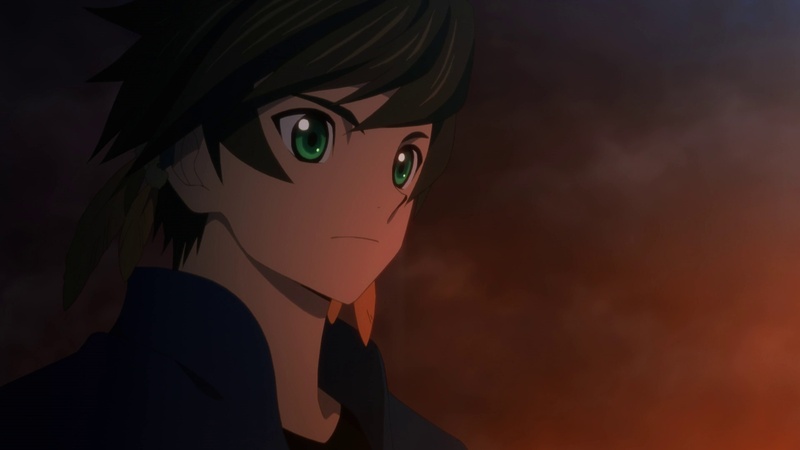 Sorey was just about to help but Alisha stops him, saying that she can handle this and implores Sorey to do something about the situation. 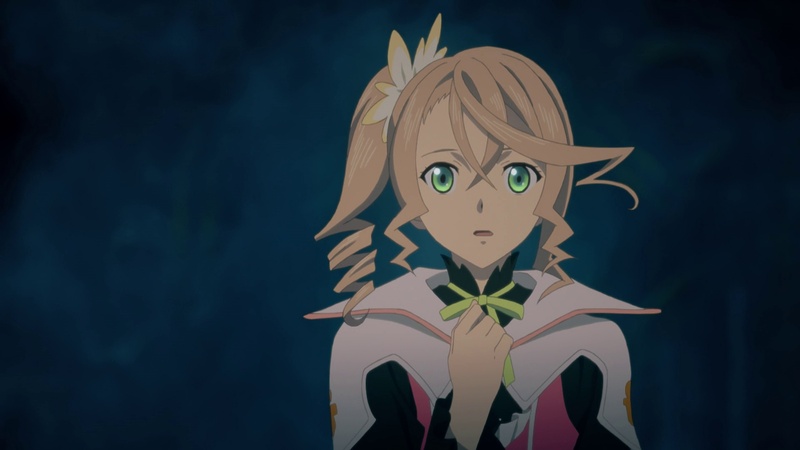 I have to hand it to anime!Alisha. Not only can she really hold her own in a fight, but her belief in the Shepherd's legends really shine through. As compared to the game, she really has more influence in making Sorey become the Shepherd. That part really fell flat on me in the game. 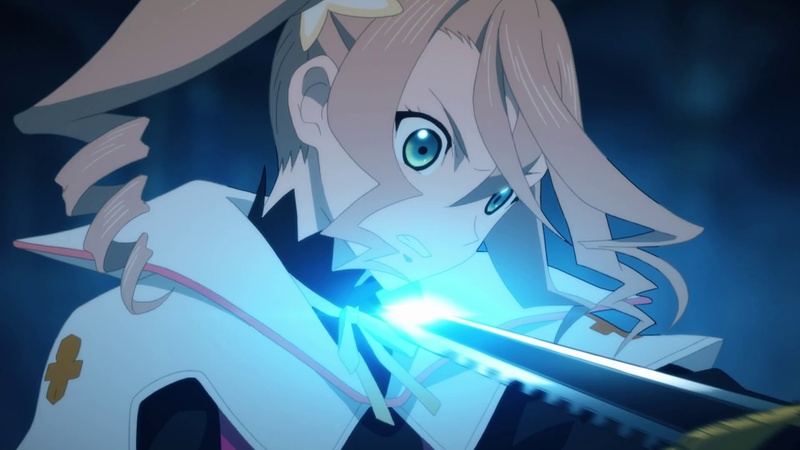 Sorey approaches the Sacred Blade, but the Lady of the Lake stops him. 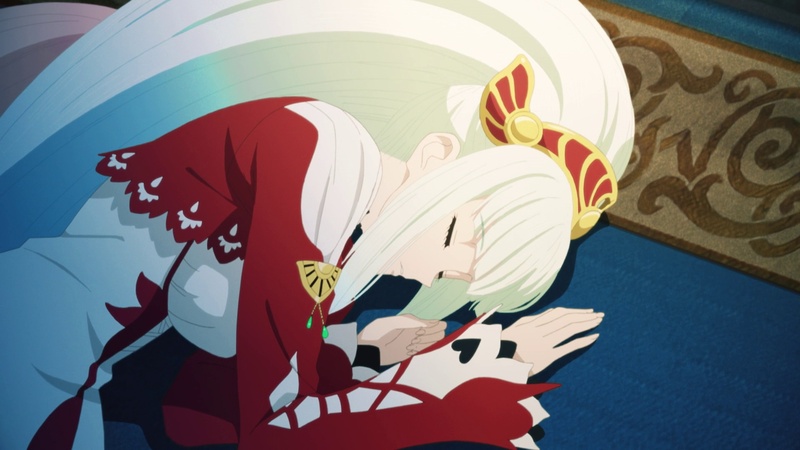 She says that Sorey, who has the affinity for the Seraphim, will probably be able to pull the sword out, but she questions why he wants to become a Shepherd. 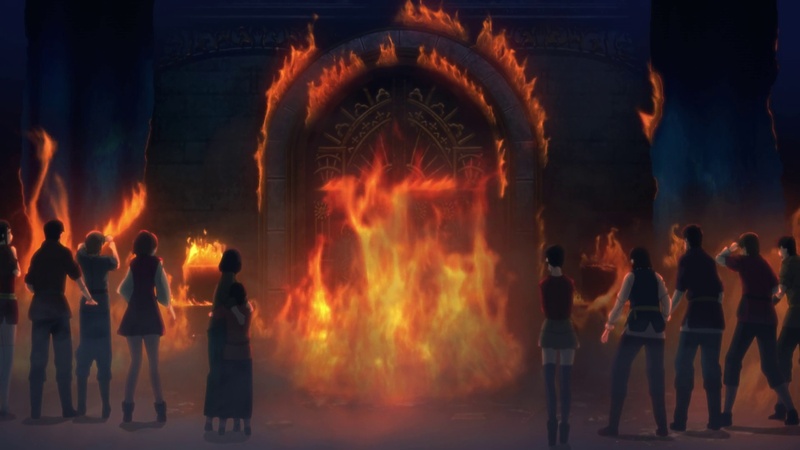 Sorey asks for the Seraphim's name, Lailah, and says that it is his dream to explore the ruins of the world and to find a way for the Seraphim and humans to live together in harmony. If he can purify the hellion and save the people there, then he becomes one step closer to that dream. 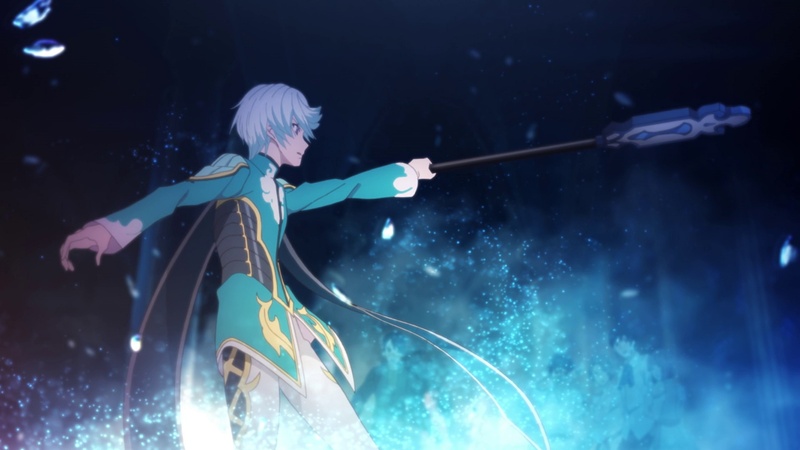 Even frozen in time Mikleo still looks fabulous. How. 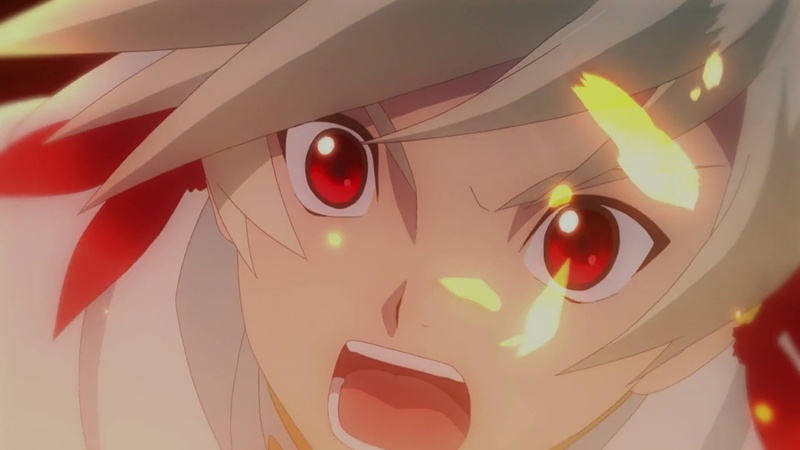 As Sorey attempts to touch the sword, time freezes around him. 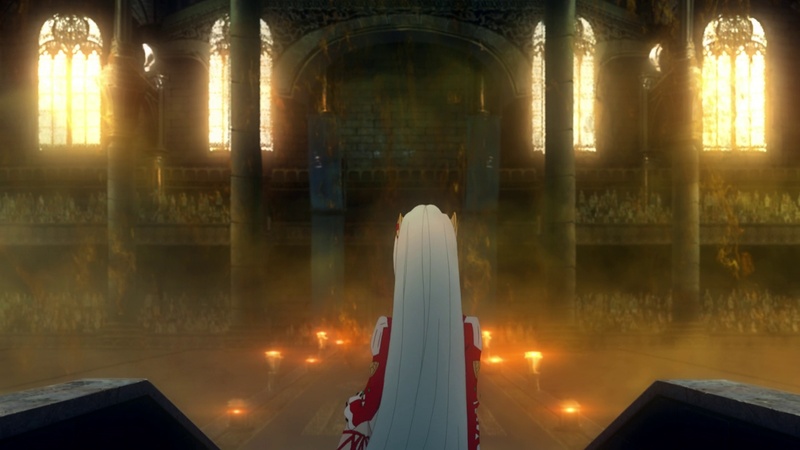 Lailah's voice explains to him that to take the sword means to become her vessel and to shoulder her destiny. The price to pay for the power of purification, among other things, is to become different and isolated from regular humans, to be forced to make difficult decisions - a battle more lonely than he could ever imagine. 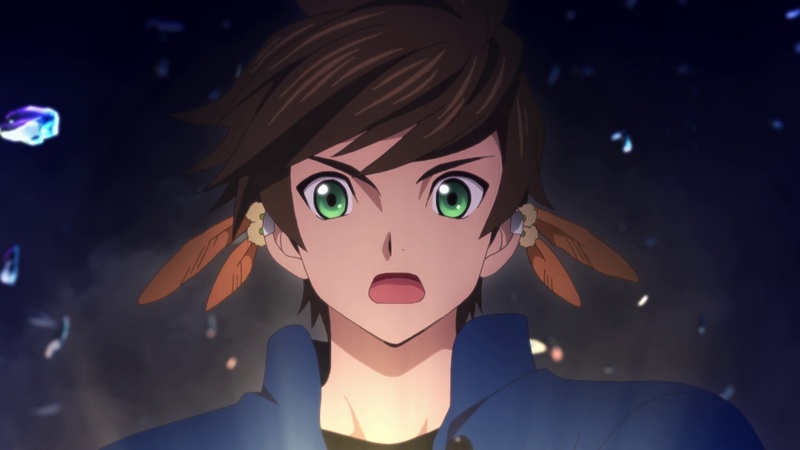 Sorey declares that he does not mind as long as he's able to save everyone there, and that the Shepherd's path is his way to make his dream a reality. 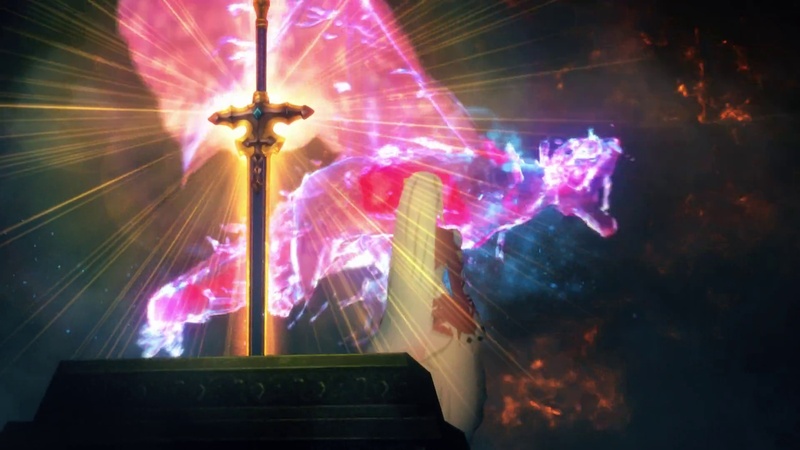 He grabs onto the sword and declares that he will become the Shepherd. The Shepherd's crest appears on his hand directly, and time continues again. 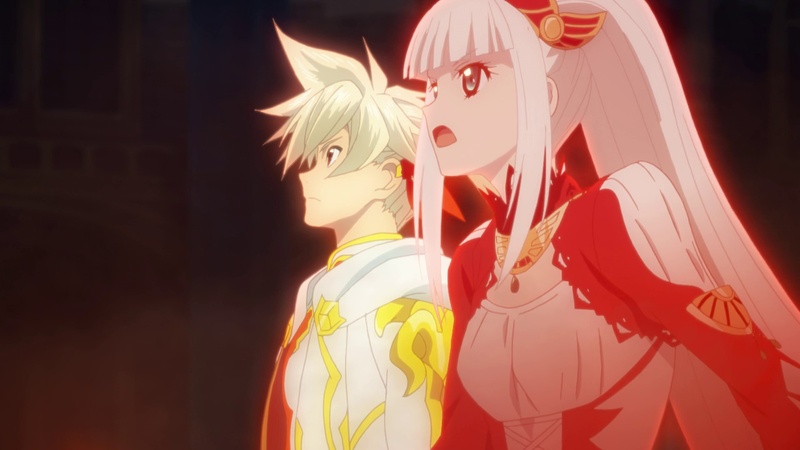 Alisha and Mikleo watch in awe as light engulfs Sorey - and from that light he emerges, attacking the dragon with his newfound power. Sorey Armatized with Lailah and fights the dragon. 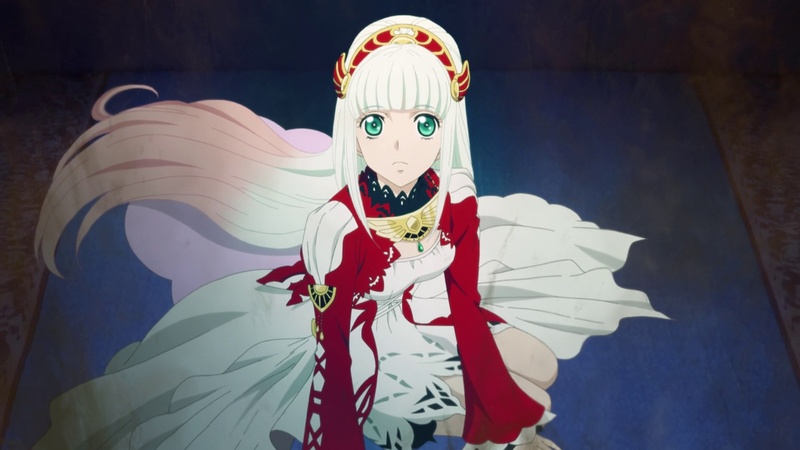 We also learn of Lailah's true name - Fethmus Mioma which literally means "Lailah the Pure." They talk about this in the next episode preview. 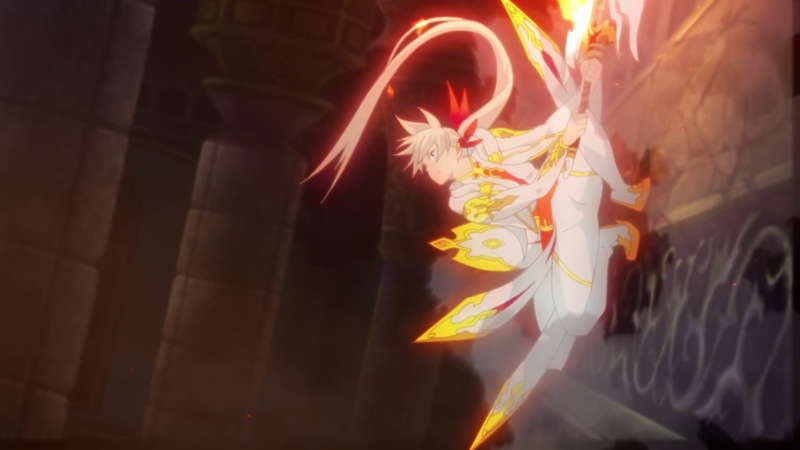 The sudden appearance of Sorey's Armatus was just spectacular. Coupled with the sudden insert of Sorey's theme just made it all the more awesome. 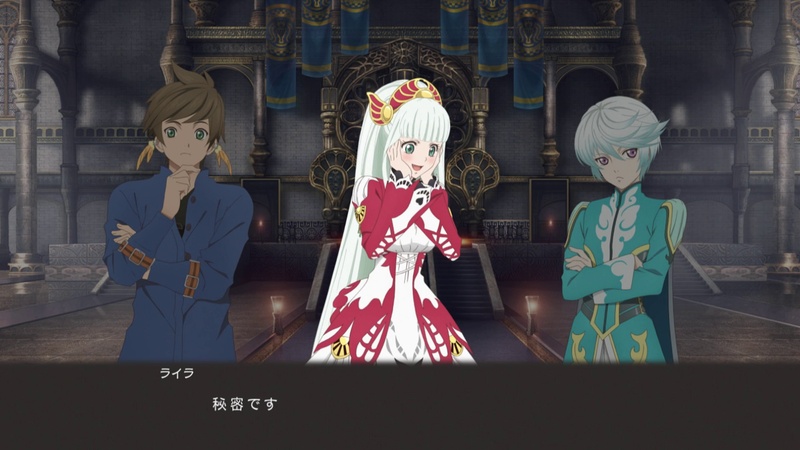 Lailah, now within Sorey, instructs him on how to defeat the dragon. 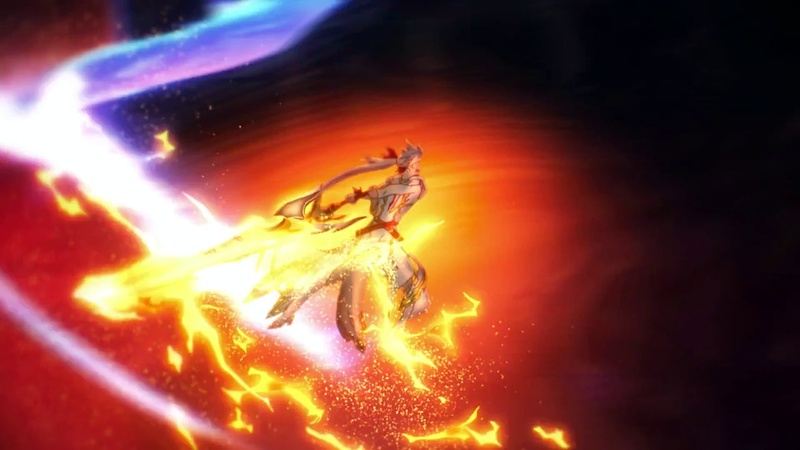 In one swing, he manages to completely kill purify it, as well as clear up all the malevolence within the sanctuary. Before them stands a young man with the Sacred Blade in his hand and who also seemingly just stopped whatever the heck was happening since the regular humans couldn't see the dragon. 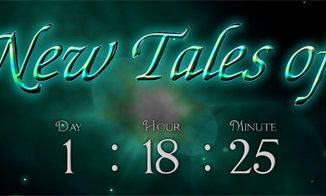 More than anything, it seems the people are filled with awe than fear...except maybe Bartlow's goons. 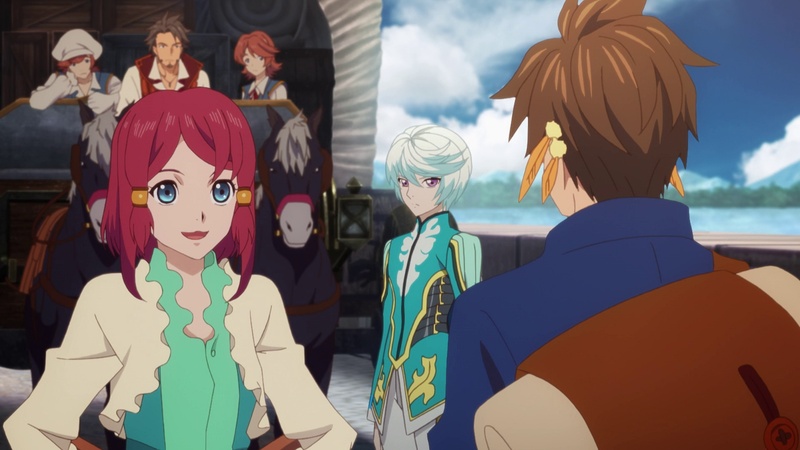 All of the people stare in awe at Sorey, including Alisha who now regards him as the Shepherd, and Bartlow's crew who can't believe their eyes. Rose also sees this and decides to retreat for now. 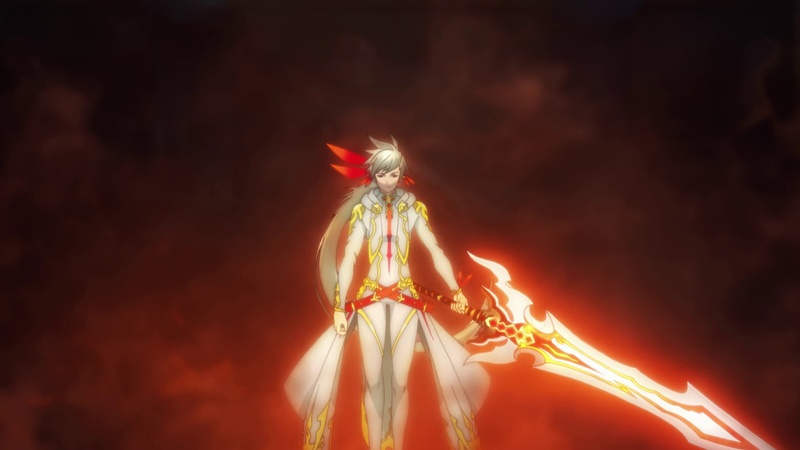 The Sacred Blade also disappears into Sorey's body. 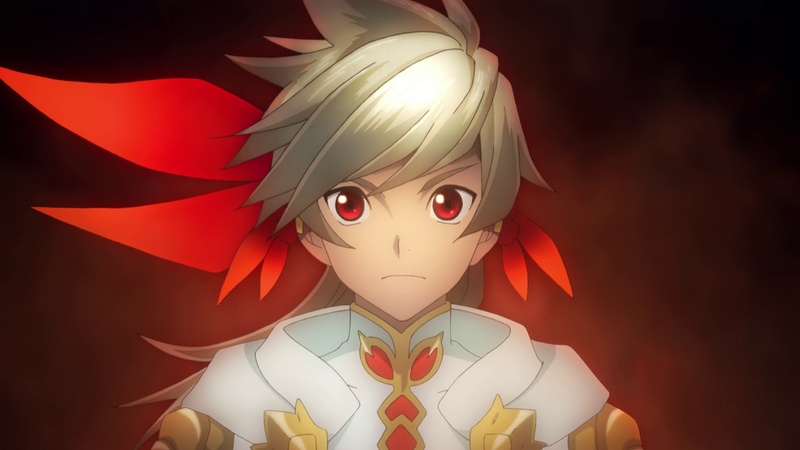 That display of power, however, proved to be too much on poor Sorey, and he collapses to the floor, with Mikleo crying out his name. 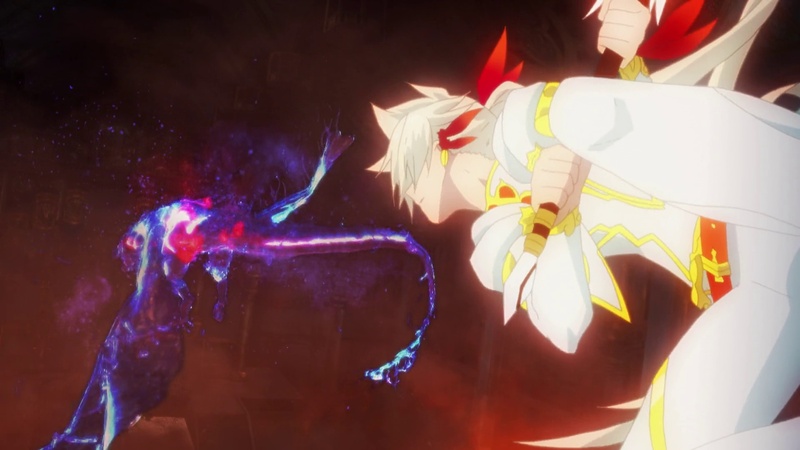 In the game, the Armatus is something that's not supposed to be seen by humans, so if they're still going with that route in the anime (they're changing a lot of things, mind you), then all the people saw was Sorey pulling out the sword and swinging his sword in the air, with that final swing making whatever calamity the humans were seeing disappear. 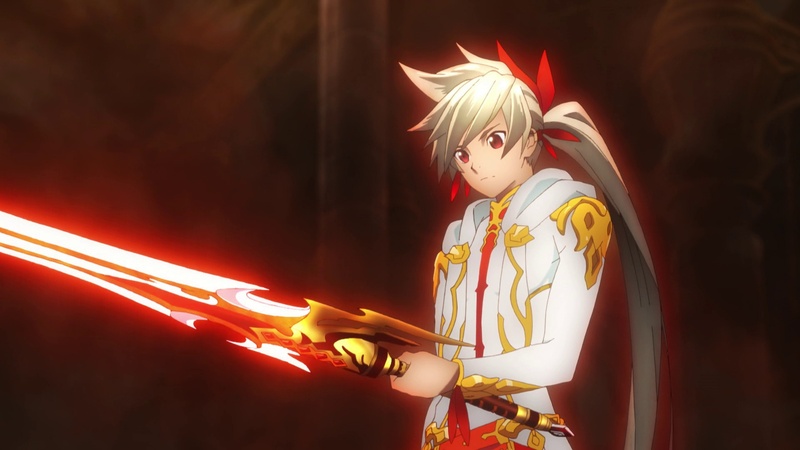 Frankly, it'd be awesome if the humans could at least see Sorey's Armatus - it adds to the whole awe value. 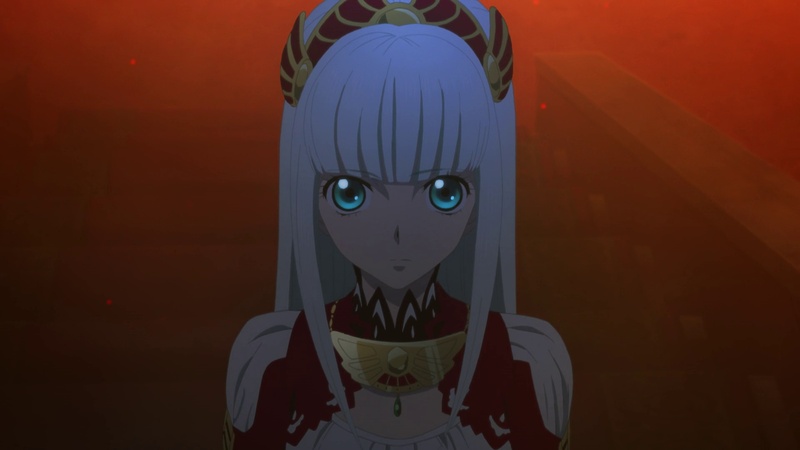 Those who have really sharp ears will notice that Lailah's voice is slightly different, maybe just a tad bit higher. 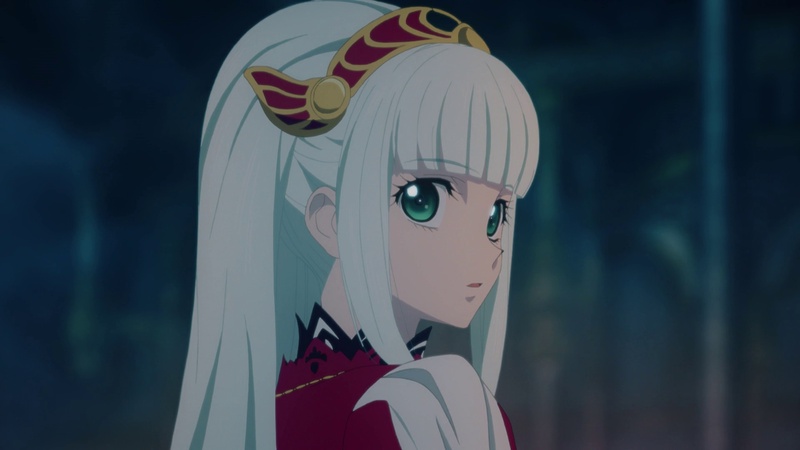 This is because Lailah's original voice actor, Miyu Matsuki, unfortunately passed away last October 27, 2015 due to a lymphoma. Our deepest condolences to what happened to her. 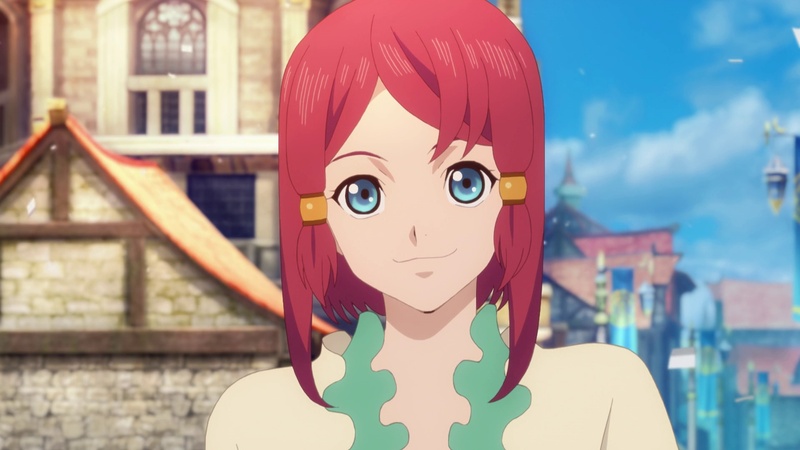 The one who took her role as Lailah, Noriko Shitaya, does a good job of sounding in character that I almost didn't notice it was someone different. 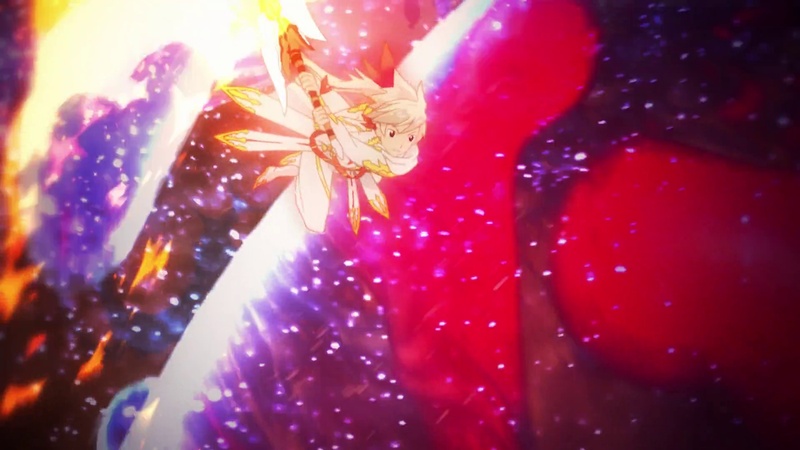 As usual, the visuals in this episode are stunning, especially during the fight scenes of Alisha vs Rose and Armatized Sorey vs the dragon hellion. 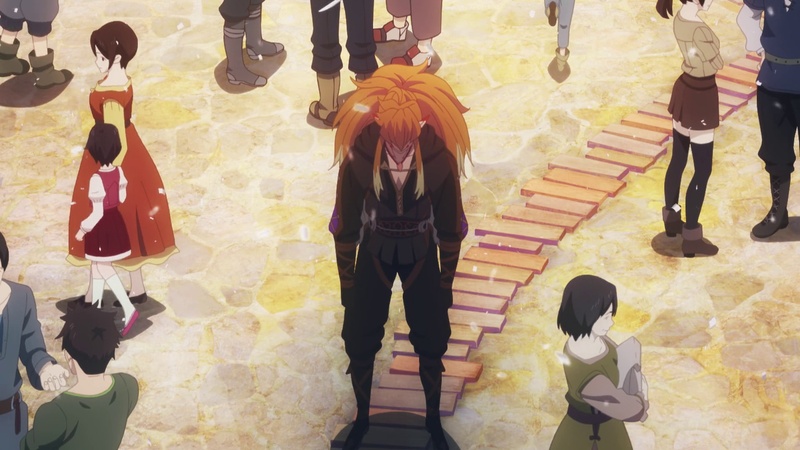 My only qualms would be during a couple of scenes that made me do a double take, where I found Maltran's and Lailah's heads a bit out of proportion (i.e. too big). That might probably just be me, though. And as usual, I had a field day with the screenshots. They're all over at our gallery, have fun! Next time - Episode #04: The Shepherd's Destiny. See you then! 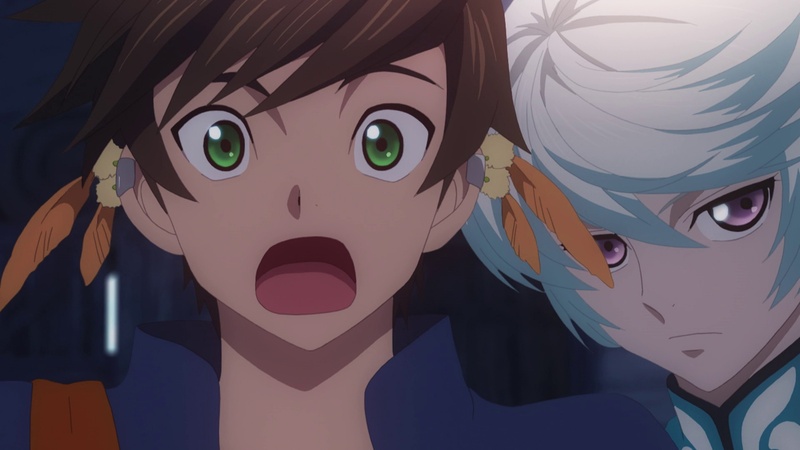 And yes, Mikleo did attempt at the funny faces. Notice: Those who watch will be glad to know that Funimation now seems to follow the localized game terminology for their recent releases. Awesome.